With its quirky 'Truck' layout and easy portability, this Mooer Multi Effects pedal has all that rock and metal musicians need out on the road. The Black Truck's effects include Space (Reverb/Delay), Modulation, EQ, Hi-Gain, Compression and Overdrive, providing you with versatile effects pedals in one, convenient unit. The Mooer Black Truck is loaded with both analogue and digital effect circuits, for a wide variety of tonal possibilities. With all of the effects in one easy to use unit and a convenient carry case, the Black Truck Multi-Effects is an ideal piece of kit for any professional gigging guitarist. Each effect has its own control section on-board the Black Truck, which makes it simple to understand and to alter on the fly. Other handy features include an effects loop, as well as Tap Tempo synchronisation and an in-built precision guitar tuner. The Mooer Black Truck has all of the controls, features and effects, for the on-the-go rock/metal guitarist to cover any sound. 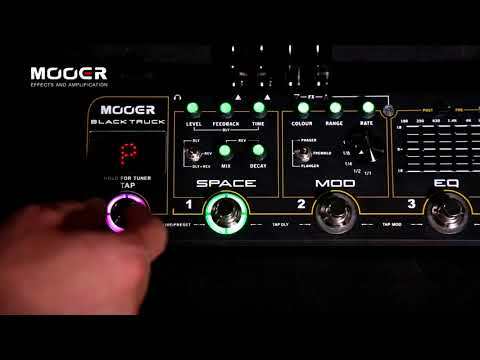 Mooer's Black Truck unit incorporates six individual effects into one portable unit. The effect sections on-board are designed for use with hard rock and metal music styles, and these include Space, Modulation, EQ, Hi-Gain, Compressor and Overdrive. In addition, there is also a built-in tuner, tap tempo synchronisation, an effects loop and a loop switcher for even more versatility. The Modulation combines Tremolo, Phaser, Chorus and Flanger together for multi-modulation. The versatile modulation controls include Colour for adjusting the intensity of the Phaser and Flanger, and the waveform of the Tremolo effect. There is also Rate which adjusts the speed of the effect, a Toggle Switch that selects the type, a Rhythm Knob for altering the sub division of the effect and finally Range controls the Phaser's depth, the Tremolo's mix and the Flanger's waveform delay. The Overdrive effect is based on Mooer's Green Mile, which delivers a warm, thick and natural analog effect. It can resemble a vintage amplifier being pushed into breakup when at higher gain settings. The controls simply include Volume for altering the output, Gain is for adjusting the amount of the effect and Tone lets you control the EQ for a brighter or darker sound. This Compression section is based on Mooer's own Yellow Comp pedal, which ranges from smooth and subtle to intense and squashed. The effect can be shaped with the Volume control for altering the overall projection, EQ which adjusts the tone and colouration of the effect, and Comp which is for controlling the parameters of the effect including ratio, threshold and release. The Hi-Gain section is designed especially for the Black Truck, as it produces an amp-like distortion that works exceptionally well with heavy music styles. This analog distortion unit can be shaped with its six versatile controls, including Volume for altering the overall output, Tone which controls adds a brighter and tight tone or creates a fat warmth. The Tweak control adjusts the low frequencies for a focused response, Gate adds a noise gate which reduces unwanted noise, whilst Mid adds a boost or scoop to the mid-range and Gain controls the amount of overall distortion. The EQ module features five different frequencies ranging from 100Hz to 4Khz, which can all be boosted or cut by +/- 18dB. Each of the frequencies feature a slider to set the levels, and there is a Level control for adjusting the output signal. Finally, the Post/Pre switch allows users to choose where the EQ module is placed in the signal chain. 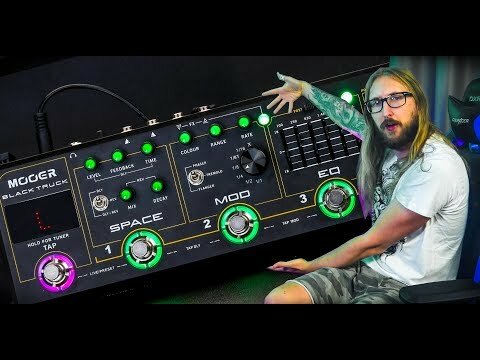 The new Space module combines both delay and reverb, which is inspired by Mooer's EchoVerb pedal. The digital delay and stereo reverb effects can be used independently or together by selecting via the toggle switch. Shape your effect with the Mix knob for controlling the blend between dry and affected tones, Decay alters the length of the reverb and Level adjusts the delay's volume. Finally, Feedback controls the number of delay repeats and Time is for controlling the length of time between the delay repeats. Dimensions: 370 x 96 x 51 mm.